This poster is one of a series published in solidarity with the Palestinian liberation struggle by the Havana-based, Organization of Solidarity With the Peoples of Africa, Asia, and Latin America (OSPAAAL) between its founding in 1961 and the mid-1980s, when funding difficulties ended the run. 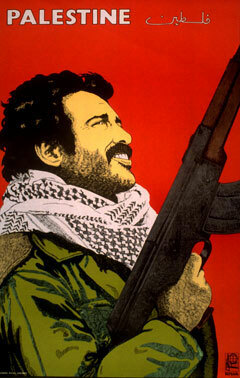 OSPAAAL-published Palestine solidarity posters were created by many of Cuba’s leading visual artists including Rafael Morante, Rolando Cordoba, Olivio Martinez, and Victor Manuel Navarette. This work is by Rafael Enriquez, one of Cuba’s most accomplished graphic designers. Through the use of a spartan, minimalist pallet — made up almost entirely of the Palestinian national colors of black, red, green, and white — and the stylistic reference to Che, Enriquez achieves a subtle, almost seamless iconographic fusion of the Palestinian and Cuban revolutions. OSPAAAL posters almost always carried some form of explanatory or exhortative text, usually in at least four languages (Arabic, English, French, and Spanish — reflecting the major languages of the geographical region served by OSPAAAL). However, this poster’s message was considered so immediate and self-explanatory that it carries no slogan, only the word “Palestine” in English and Arabic. The rifle is pointed upwards and cropped midway along its barrel, signifying that it is not as important as the confident, determined revolutionary spirit of the guerrilla. That spirit, manifest in Guevera, is the core resource of any liberation struggle and the element that would most disconcert opponents and inspire allies. OSPAAAL posters were printed in vast numbers and enjoyed a unique international distribution system: they were folded and stapled into the pages of OSPAAAL’s flagship publication, Tricontinental, which had an international student subscriber base of several hundred thousand, according to official estimates. 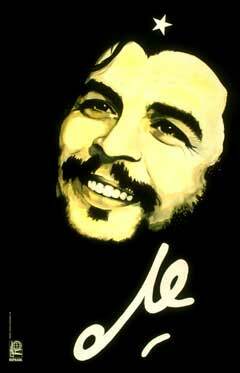 OSPAAAL posters reflected the outspoken, intellectually aware perspective of the revolutionary left. In a sense, OSPAAAL’s posters are the contemporary equivalent of Spanish Civil War posters, because they are unabashedly internationalist in spirit and are highly sought after collectibles — even by political conservatives. OSPAAAL was the only Third World organization to ever systematically mobilize graphic art as a political resource and deliver it on a regular basis to a global subscribership. In doing so, it created an international appreciation for Cuban political poster art, which endures to this day. 1) What explains the fact that the artists of many nations and national liberation struggles — many of whose works are celebrated and even collected by professional design associations, museums, galleries and private collectors in the West — see the Palestinian liberation movement as legitimate and heroic? 2) This poster attempts to visually fuse the Cuban and Palestinian revolutions together as a way of saying that they are one and the same thing. Are they? If yes, what elements do they have in common? If no, what are the differences? 3) The American-Israel Public Affairs Committee (AIPAC) carries on its homepage banner this description from the New York Times regarding its political significance: “The most important organization affecting America's relationship with Israel.” According to the Center for International Policy, “The Cuban-American National Foundation (CANF) was founded in 1981. Modeled on the Jewish-American lobby of AIPAC, the group — like AIPAC — has traditionally wielded strong influence in Washington.” Does the close association of AIPAC and CANF strengthen or weaken the claim of this poster — that the Cuban and Palestinian revolutions are connected? © 2003 Liberation Graphics. All Rights Reserved. Another democracy-building arts initiative of Liberation Graphics.